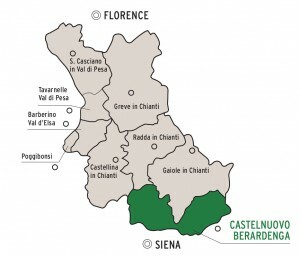 The territory included in the Chianti Classico production zone looks like a large rectangular plaque, outlined, in its eastern part, by the Chianti Mountains. It is a high plateau, between the provinces of Florence and Siena, and precisely divided into 9 municipalities: Castellina in Chianti, Barberino Val d’Elsa, Poggibonsi, Tavarnelle Val di Pesa, San Casciano in Val di Pesa, Greve in Chianti, Radda in Chianti, Gaiole in Chianti, Castelnuovo Berardenga. Castelnuovo Berardenga is the town, within the Chianti Classico area, which extends furthest south, “licking” the equally famous lands of the Crete Senesi. It is also, without any doubt, “the most Senese Chianti Classico”, due to its great proximity to the capital city, of Siena. The scenery that unfolds before ones eyes, in the Castelnuovo Berardenga territory, is undoubtedly unique. First of all, from various corners of the area one may enjoy a breathtaking view of Siena, with its towers and its symbols, framed by the typical Chianti landscape: undulating hills alternate, as far as the eye can see, rows of vineyards and olive groves, interspersed occasionally with sunflower and wheat fields, centuries old cypress trees lining dirt roads leading to ancient estates, bushy patches of dark green forest. Even in winter, when the countryside loses the bright colors and the whole landscape seems to become lazy and uniform, the charm of these hills remains constant, thanks to the “green continuity” of the olive and cypress trees, lasting symbols of rural Tuscany.